Ok, I am still alive. Nancy reminded me I havent updated my blog in awhile. Soooo. I have had a cold/sinus thing going, cant seem to shake it. Been trying to catch up on customer quilts, getting close. Went yesterday to our new longarm group in Columbia. This was our 2nd get together. If you are from the middle of SC and have rails, you are welcome to join us. We are sharing and learning from each other. A great group. RRCB!!! 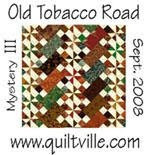 I am still working on Bonnie Hunters mystery quilt. Putting the hst around the blocks, have about half finished. So, I am a turtle. It will get done, when it gets done. I am enjoying the process. We have a new quilt shop in town. The only one! Now I can buy a spool of thread, or anyother need without driving to Columbia, 45 miles away. 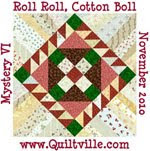 They have asked me to teach some beginner quilting, so I am going to teach a sampler class to start with. I have used this for several beginner classes in the past. It will get me out of the house some. Sorry, no pictures at this time. Will try to take some of my RRCB later today, so you can see the progress. Tell us more about the quilt shop. Think I can get them for a vendor by the fall retreat? I am in charge of vendors this year! I hope you feel better, this has been a bad winter for sinus for a lot of people. 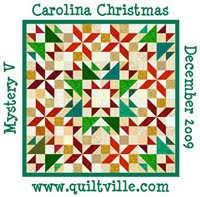 I'm looking forward to checking our your new quilt shop when we come for spring meeting. Isn't it nice to have a local quilt shop? Hope they do well.